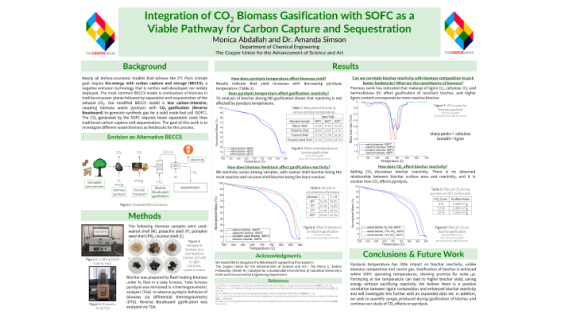 Monica Abdallah's research poster: "Integration of CO2 Biomass Gasification with SOFC as a Viable Pathway for Carbon Capture and Sequestration (CCS)"
Monica Abdallah ChE'17, ME'19, a current chemical engineering graduate student advised by Prof. Simson, attended the 2018 AIChE Annual Meeting in Pittsburgh, PA on October 28-November 2, 2018. The AIChE Annual Meeting is a platform for researchers, academics, and industry leaders to discuss innovative research, new technology, and emerging disciplines within the field of chemical engineering. At this year's conference, Monica presented her graduate research on "Integration of CO2 Biomass Gasification with SOFC as a Viable Pathway for Carbon Capture and Sequestration", which proposes an alternative electricity generating model that has the potential to be carbon negative when integrated with carbon capture and sequestration (CCS).